Gateway Theatre’s Canadian premiere of the comedy, Yoga Play, is a fun, satirical look at the yoga apparel industry. While the play has a clever main concept – exploring the disconnect between the spirit of yoga and the competitive retail world – the show takes on a few too many plotlines for it to handle and isn’t able to adequately follow-through with its storytelling. Written by Dipika Guha, Yoga Play tells the story of the newly-hired Joan, who is brought onboard to lead Jojomon, a yoga apparel giant. The company’s founder puts on a persona of embracing spirituality and open acceptance of humanity, yet refuses to make his products available in women’s sizes 8 and up. In fact, the whole company seems a bit bonkers. Everyone – staff and the millions of worldwide customers – are referred to as Jojomon’s “family”. The office culture includes “Dream Time”, when employees share the dreams they’ve been having with each other. Amid all this “spiritual” culture, Joan suddenly has her hands full when a major scandal hits Jojomon and the company goes into a free fall. In an effort to restore Jojomon’s reputation as a brand that exudes truth and authenticity, Joan and her colleagues Fred and Raj decide they need the face of an influencer to save the company. And not just any influencer – a genuine yoga guru. And this scheme turns out to be more difficult than anyone can imagine. I loved the concept of this play for many reasons. First, the whole scheme to find a yoga guru and the chaos that ensues is wonderful fun. Secondly, the story really showcases and makes light of the stark differences between the premise of yoga and its roots in spirituality and enlightenment, and the cutthroat retail world. Moreover, Yoga Play offers a tongue-in-cheek look at the pretentious culture of a yoga apparel giant, and some of us might even think that this mimics a real-life company that we love to hate (yet probably still buy its products). 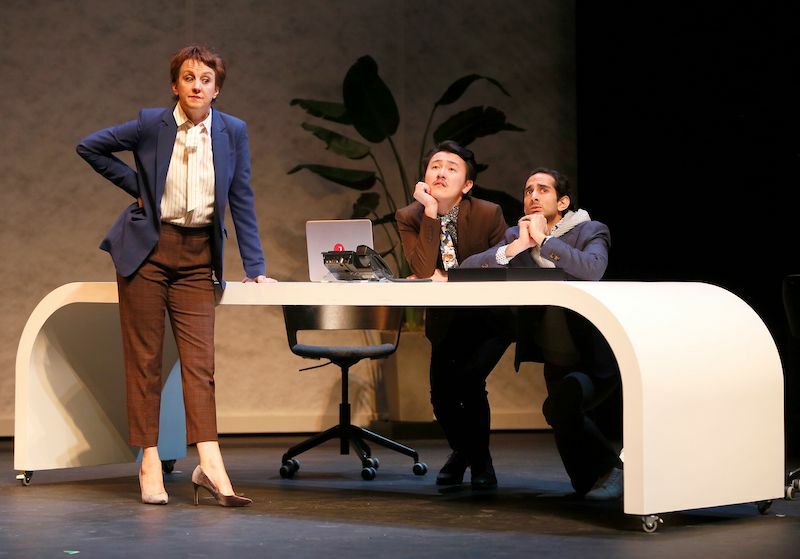 Additionally, the play is also an amusing take on some modern, workplaces – in this case, it’s a workplace where the employees sit on yoga balls, drink smoothies for lunch, and talk about their feelings. And there’s some very creative use of social media and live streaming during the show, all projected on a giant screen. This play has some very smart elements that makes it current with the times. Throughout all of this, Joan is struggling with her own personal issues. That in itself would have been a great subplot. But Guha has written subplots for both Fred and Raj as well, and she isn’t able to smoothly complete the character arch for any of the characters. Because of all that’s going on, we never really get to dive into Joan’s personal story. And Fred and Raj’s stories have resolutions at the end that seem weirdly abrupt and confusing. Add to that the character of yoga teacher Romola, who never really gets developed but seems to oddly take an integral place in one of the character’s resolutions at the end. Character development, storytelling, and flow are unbalanced in this show. Lois Anderson does a fantastic job as Joan. What makes her interpretation so hilarious, is that she doesn’t fit into Jojomon’s culture at all. Her rational and business strategy-thinking appears to be the opposite of what’s going on at Jojomon. Joan’s agitation with the situations she finds herself in are fun to watch. As Joan’s wingmen, Derek Chan and Chirag Naik are also a barrel of laughs as Fred and Raj. Guha’s script does tackle some pretty heavy stuff at times, and Chan handles the serious elements of his character as well as he does with the humour. Both Shawn Macdonald and Christine Quintana deliver solid comic timing in their roles as John Dale/Bernard Brown, and Romola. Sophie Tang’s set design is quite a gorgeous piece of work. Her design creates a contemporary office feel for the Jojomon workplace, and the openness of her set makes for a great space for the yoga scenes at Romola’s studio. Another outstanding element of the show is the sound design of Mishelle Cuttler. The sound effects, such as the social media notifications, and the ringing of cell phones onstage (I think Raj’s ringtone is set to a Drake song?) are creative, convincing, and add nice touches. The live video streaming is also very well done. Director Jovanni Sy has done a fine job with putting all the above elements together. While the play’s script could benefit from more balanced storytelling, the premise of the show itself is smart and entertaining, and the irony of it being performed in Vancouver was definitely not lost on me. Gateway Theatre’s production of Yoga Play runs until February 16. For tickets and more information, visit Gateway Theatre’s website.